So the inspiration for the Poke (pronounced poh-kay) bowl was an unfortunate one. Yesterday there was a gruesome murder where the victim was stabbed by his father-in-law and ended up dying in front of a cafe called “A Poke Theory”. Poke cafes have been springing up all over Singapore as the next big thing. It’s not surprising that it has caught on in a big way because Japanese food has always been popular in Singapore and the Poke dish is actually a Hawaiian take on the original chirashi bowl in sushi restaurants. The difference in Hawaiian Poke meals is that the cast off bits of raw fish are marinated and served with any combination of flavours, whereas the Japanese version presents the freshness and pure flavours of the fish alone. Anyway thanks to this awful event, I had an unexplainable craving for raw fish – I think only people who love sashimi and sushi would understand that. I don’t really eat sushi as it is full of rice that would make my sugars spike super high. Sashimi is great but pretty expensive and I thought that the poke bowl would be a hearty but healthy meal on its own. 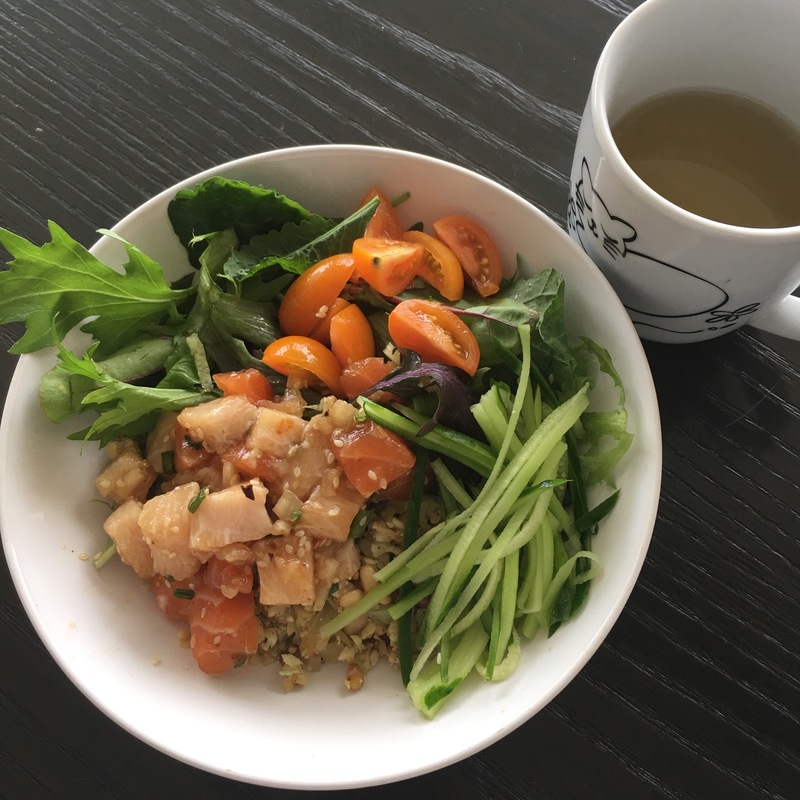 For this Poke bowl, I used salmon and swordfish, both my absolute favourite fish varieties. Most pokes actually use tuna but I much prefer salmon instead and have a truly truly soft spot for raw swordfish. For the usual sushi rice portion that forms the base of Poke bowls, I made a kind of cauliflower rice pilaf with pine nuts to add a crunchy texture, and served the pilaf and Poke with salad greens and cucumber to bulk up the meal. Hubs is always a good companion for this kind of cooking. Kid#1 hates fish thanks to his childhood of multiple food allergies and kid#2 usually looks at raw fish skeptically. Preparing this lunch was easy and fuss-free. Thanks to a recent eye surgery I’ve been banned from heavy lifting and I figured this kind of cooking which is mostly washing and preparing and cutting vegetables should be perfectly safe. For the cauliflower pilaf I slightly undercooked the cauliflower just to make sure that the pilaf was crunchy to balance out the squishy fish. And I’m sure all the vegetables in this dish would give enough antioxidants for my recovery! It’s crazy how something that looks and tastes so good could be so healthy at the same time. This probably won’t be the last post on poke bowl recipes here as I’ve suddenly become inspired and I’m looking forward to other variations including seaweed and avocados. And just after hubs and I finished our poke bowls I discovered I’d forgotten the tobiko (flying fish) roe in the fridge. Ah well, it can only be part of the next poke bowl! This is really the perfect dish to put together at home. Carefully cut the fish into cubes. Finely minced half an onion. Slice the spring onions. Toast the pine nuts and sesame seeds separately in a dry, non-stick pan. Set aside. Mix the fish, onions, spring onions and sesame seeds together. Add the soy sauce, sesame oil, ponzu sauce, pepper, sugar substitute and crushed red peppers and mix well. Using a food processor, chop the cauliflower to fine rice-sized pellets. Over medium heat, sauté the chopped onion till fragrant and translusceny, about 2-3 minutes. Add the cauliflower to the pan and sauté further for about 5 minutes. Add the pine nuts, salt, pepper and paprika and sauté further till the cauliflower is just slightly tender but with a little crunch still. Remove from the heat and set aside. In bowls, place the cauliflower rice pilaf first, then layer with a handful of salad, julienned cucumber and top finally with the marinated fish mixture. Serve immediately to enjoy the crunchy and hot and cold mixture.